Cuddles & Care hires only the very best to care for your pets. All of our pet sitters are fully trained, bonded, and insured. Every member of the Cuddles & Care staff has pets of his or her own. Diana is the current owner of Cuddles & Care. After working with the company as a pet sitter for 4 years, the opportunity to purchase the company was presented to her when the former owner decided to relocate. She quickly said "Yes!" and began the journey of fulfilling her dream of owning a pet sitting company, while still doing visits for all of her furry friends. Diana is mom to cats Needy & Kiki, a Miniature Schnauzer named Piper, a Rottweiler named Esteban, and a Shih Tzu named Couper. Diana is pictured at left with Esteban. Jaime Breit is the founder and previous owner of Cuddles & Care. 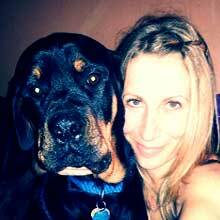 With her background in business management, and her lifelong love for and experience with so many kinds of animals, she realized that Pet Sitting was her calling and opened Cuddles & Care Pet Sitting Service in February 2000. 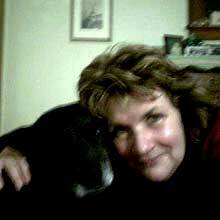 Pictured here with Max, Jaime is now mom to two rescue pets, a Border Collie/Shepherd Mix named Benny and a deaf cat named Frances. Mary Anne joined our staff in 2007. 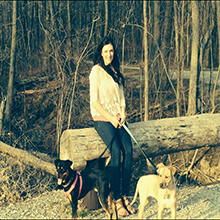 She provides Dog Walking and Pet Sitting Services primarily on weekends and holidays, as well as occasional weeknight visits when needed. Most of your pets will meet Mary Anne, if they haven't already, as she and Kim take over the majority of our vacation bookings each weekend. Mary Anne is mom to four dogs and 13 birds. She is pictured here with Sophia Loren. Noelle joind Cuddles & 2017. She provides midday services, vacation visits, and overnights. 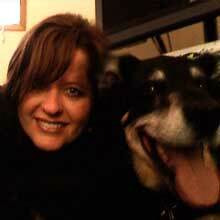 Noelle has 18 years experience of raising cats & dogs, and over 10 years experience with pet sitting. "Animals gravitate towards me & we understand each other", she says. Noelle is proficient at photographing pets. A true animal lover, she Volunteered several years to raise money for the APL by collecting donations, and also fielding phone calls during the annual pledge for pets radioathon. 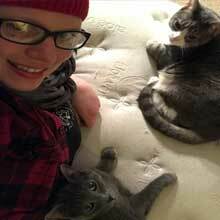 Noelle is pictured with her two cats, Valentine and Sumara. Being the daughter of the owner, Diana, Angel has literally been around animals her entire life. She also has over 5 years experience and training for pet sitting. Angel provides midday services and vacation visits. She loves to go to the APL to take the dogs out for walks and play with the cats so they have attention. Angel has two cats of her own, Pancayke and Frankenstein. She also lives with three dogs. 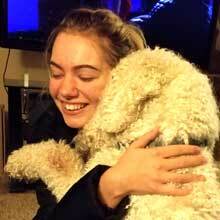 Angel is pictured here with Reddington, the Goldendoodle they have had since a puppy. Alyxandra joined Cuddles & Care in early 2018. She is a long time vacation client of ours, so she has been on both sides on the business now! She has three dogs, two cats, three chickens and two ducks of her own as well! She and her family foster animals and became "foster failures." Haha. Alyx has experience with all types of different breeds of dogs and ages. She is pictured with Roscoe and Bailey.